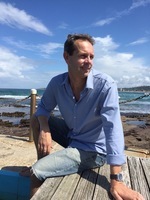 Australian composer Brendan Collins grew up in the city of Newcastle. He studied trombone and composition at the Sydney Conservatorium of Music with Ron Prussing, Arthur Hubbard and George Golla, whose teaching he found invaluable. In 1984 he won a scholarship to study in Los Angeles with Ralph Sauer, principal trombone of the Los Angeles Philharmonic. Brendan Collins was the Associate Principal Trombonist with Opera Australia from 1991-2002. He was appointed composer-in-residence at Barker College in 2005. In 2006, he was the composer-in-residence with the Sydney Youth Orchestra, composing three works for string orchestra. He has composed numerous works for a wide range of ensembles, and his works are very popular among some of the world's finest professional and student musicians. He has received commissions from leading artists and organisations such as Rex Richardson (USA), Richard Stoelzel (USA), Steve Rosse (principal tuba of the Sydney Symphony Orchestra) and Jose Chafer (Spain) as well as the Sydney Youth Orchestras, Ku-ring-gai Philharmonic Orchestra (A Spider's Tale; Odyssey - a work commemorating the spirit of ANZAC with text by Justin Fleming) and the NSW Bands Association (C and D Grade test pieces for the National Band Championships). In 2010, his composition William of Orange March won first prize in the New South Wales School Band Festival composition competition. His Trumpet Mambo was commissioned by the International Trumpet Guild for a performance at the 2010 conference in Sydney. His compositions have been performed at all subsequent ITG conferences, and he was selected to conduct his own work in Michigan in 2013. Collins has toured the USA and New Zealand as a soloist. He also toured Europe, in 1984, with the Australian Youth Orchestra. He has performed with the Seymour Group, Royal Ballet, Warren Daly Big Band and The Cats Production Orchestra, Sydney. In 1982 while still a school student, he performed the Rimsky-Korsakov Trombone Concerto with the Sydney Symphony. In 2006 the NSW School Band Festival named a section in his honour. Stomp : trumpet with piano (2015) Commissioned as the test piece for 2015 International Trumpet Competition in Meppen, Germany. Endeavour overture : for string orchestra (2006) Commissioned by Sydney Youth Orchestra Association.